The Tactical Devil uses Bog-Pod's Switcheroo Shooting System to easily switch between accessories in the field using the same platform. It has three-section, high-strength, lightweight aluminum legs with matte black finish. The Universal Shooting Rest swivels 360 degrees and is rubber covered to prevent damage to gun stocks. The rapid-adjust lever locks with adjustable tension. The legs adjust independently out to a 40-degree angle with adjustable tension, with inch markers on middle leg sections help to quickly reach a set height, and an all-terrain foot system with rubber feet that screw up to reveal a steel tip for better grip on ice. 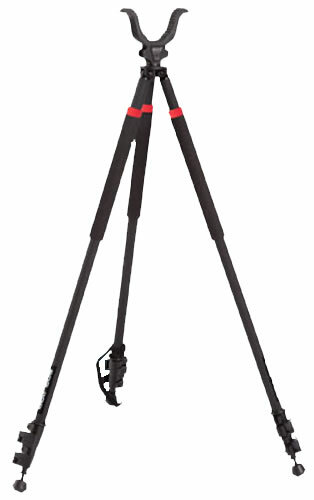 Use in prone, sitting, or kneeling positions - from 22" to 68" usable height when legs are spread. When closed for carrying it is 31". It weighs approximately 40 oz. A carry bag and allen wrench are included. Great gun rest, the best on the market for the price.